My Hall of Fame Binder posts have been quite entertaining for me to write about. They also seem to fairly well viewed and I appreciate the comments you, the reader, have been leaving. It's a rare day when I come up with a good idea on my own. For the record, the amount of joy I've had from putting the HOF binder together makes it a great idea, but it wasn't my idea. AJ, The Lost Collector, was collecting cards of Hall of Fame players for his son a couple of years before I decided to stop being jealous of a newborn and do something about it. 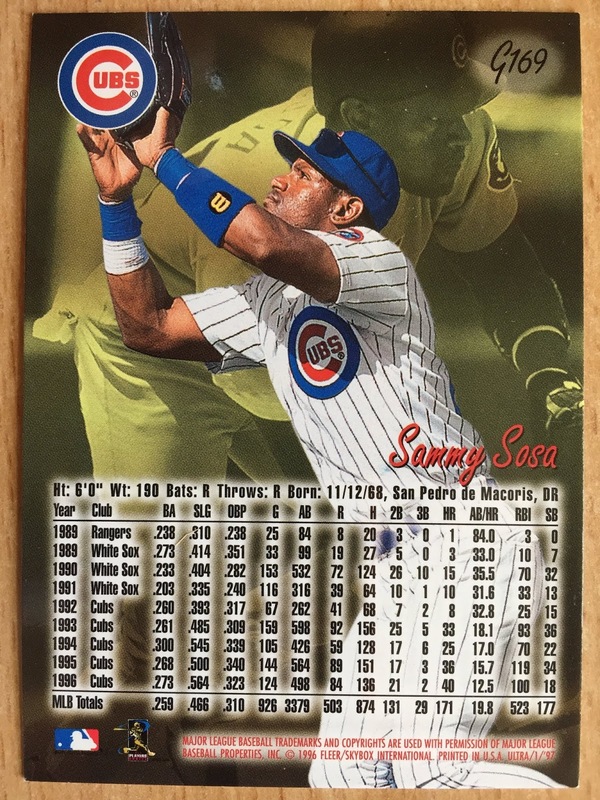 Not only did AJ help to inspire my favorite new project, but he just sent me a PWE of Cubs. Let's take a look at what a fifty-five cent stamp can deliver. 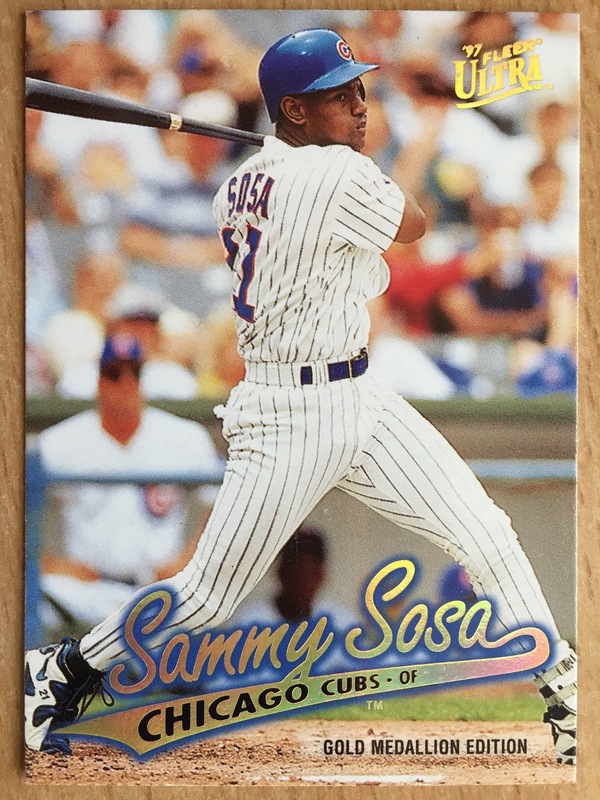 First up is a Sammy Sosa card from 1997 Fleer Ultra. At first glance I thought it was the base, because I'm not all that familiar with Fleer Ultra from the late 1990s, but the number on the back tells me this is a gold parallel. That's quite a nice start! 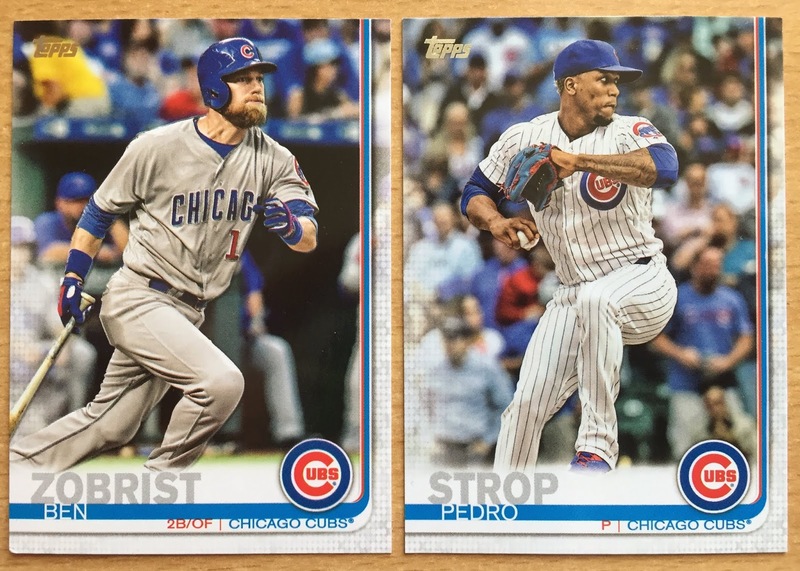 I bought one pack of 2019 Topps Series 1 and that will probably be my last. 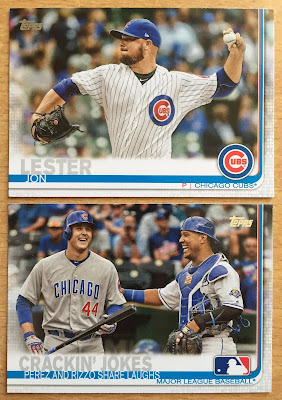 I was lucky enough to find two Cubs in that hobby pack. AJ is helping me build my team set. Zobrist is my favorite Cub and Strop is definitely in the top five. I'm hoping Lester can keep his ERA under 4.00 this year. I look at his secondary pitching stats and keep wondering when the wheels are going to fall off. The Crackin' Jokes card is a checklist card and I'm okay with that. I love candid photos. 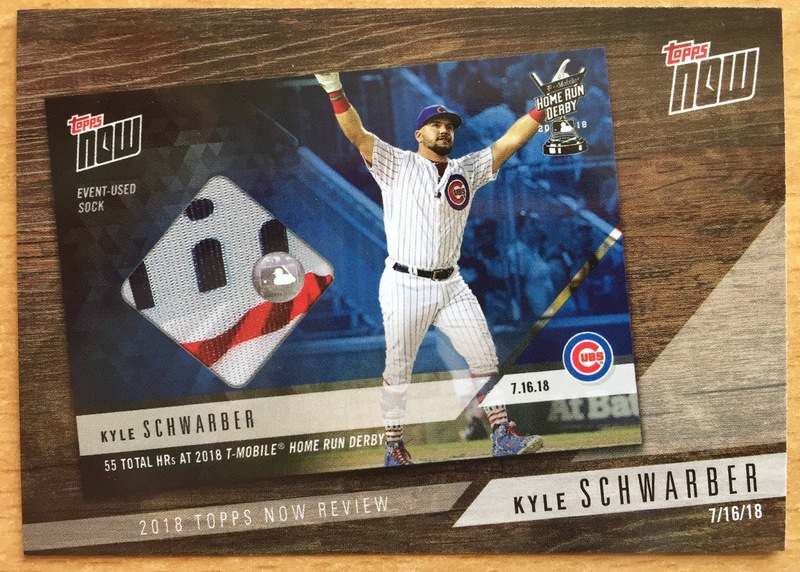 I, like many collectors, could do without the Topps Now advertisements. It is what it is. How about this card? Sweet action shot of a flying Albert Almora and it's all foiled up! 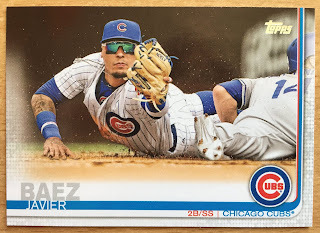 This card is my favorite base card from 2019 Series 1 so far. 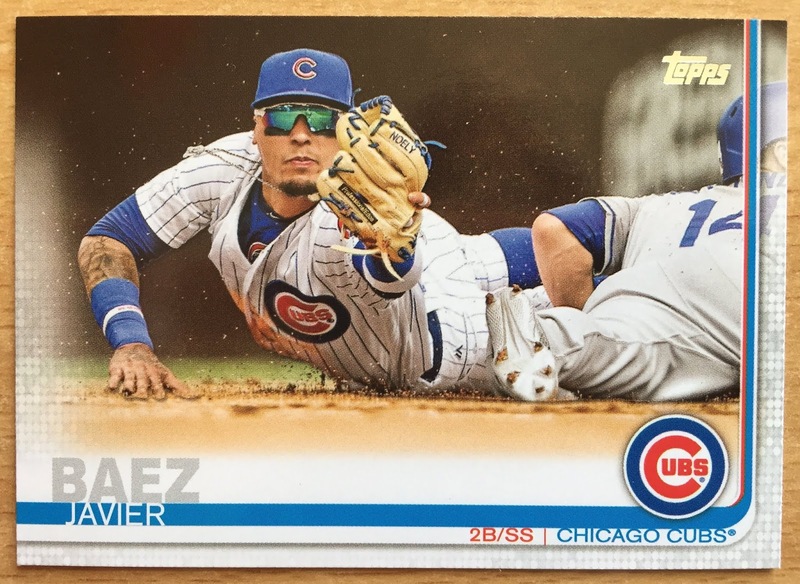 I haven't seen all the photos that were used yet, but this is a unique shot and one that speaks to Baez' defensive skill set. 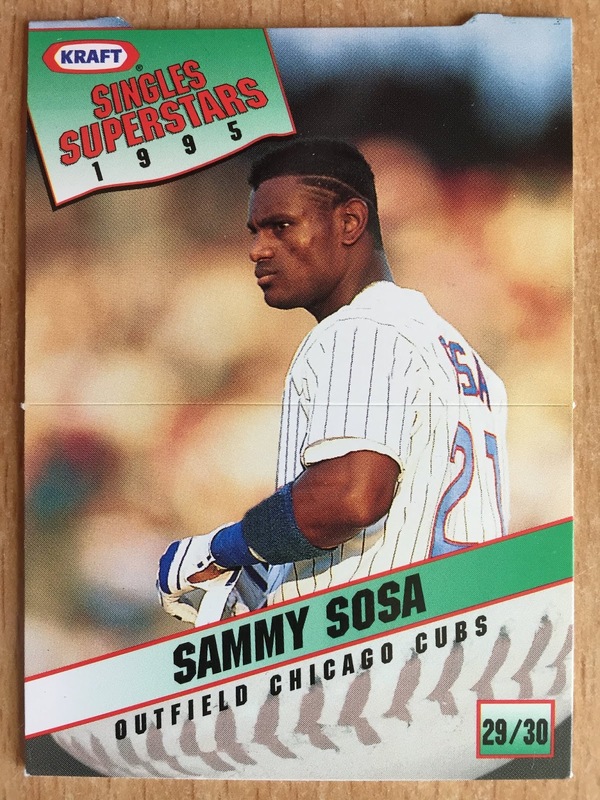 We started with a Sammy card and we'll finish with a Kraft Singles SuperStars card of Sammy. Food issue cards are the best oddballs in my opinion. 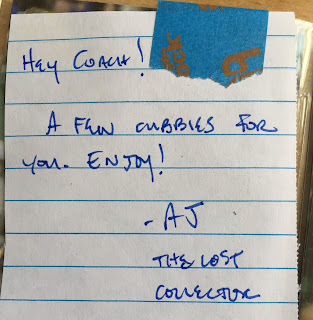 AJ, thank you for the Cubs cards. Also, again, thanks for the HOF binder idea. It's been a lot of fun so far! It's nice to hear that your HOF binder posts are going over so well, as they are quite enjoyable to read. 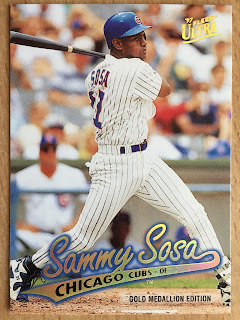 That first Sosa sure is great, the Gold Medallions were always fun. Oh man. I really have to do a better job keeping up with my son’s HOF binder after those kind words. I'm so used to seeing so much extra gold on the Ultra gold medallions. That Sosa is kinda refreshing. 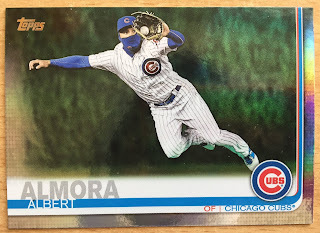 And that Almora is one of my favorite base card so far from 2019 Topps. 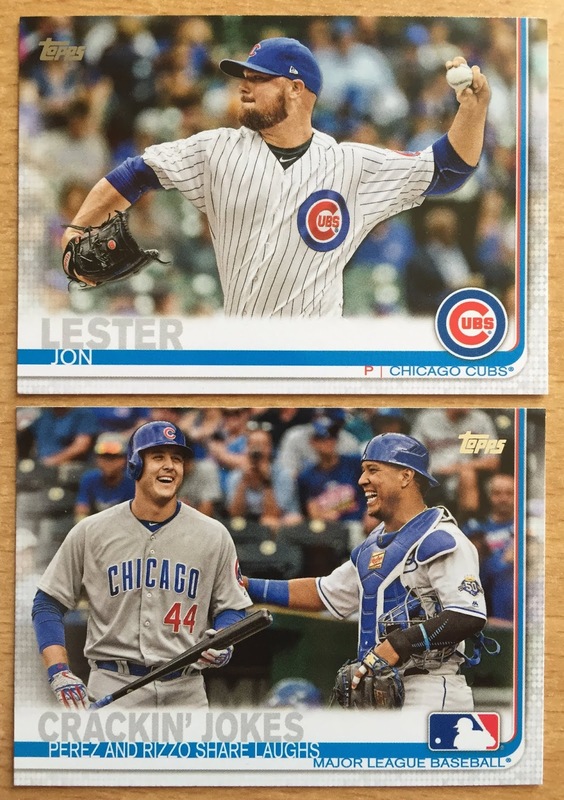 Almora and Baez shots are exc choices by Topps. I rarely compliment them, may never happen again. Food! It's dinner time anyway but now I'm craving mac n cheese. That's Kraft!